The North and South Bass trails are about 25 miles west of the main trails in a little used section of the park. A packrafting trip in Grand Canyon will get you to these remote trails that are typically only assessable to river rafters. In order to get to the trailhead, the group will travel along dirt roads for about 2 hours. This route features one night of camping on the South Rim before entering the canyon on the second day and one night of camping on the Colorado River at one of the major rapids in the canyon. Of course this tour features the amazing views that the canyon is famous for. This route is only achieved by paddling across the Colorado River in a pack raft. In addition to the regular backpacking gear, each member of the group is outfitted with his or her own raft, paddle, and life vest. This route features Native American ruins, remains of old tourist camps and amazing views of the inner canyon in an area that few people reach when they visit the park. *Route Variation – The specific hiking route and campsites on each departure are dependent upon permit availability. To get to the South Bass trailhead, you will need an off-road vehicle. Part of the drive is along 35 miles of dirt road for some 4×4 fun! Once at the trailhead, set up camp for the night and explore the remains of William Wallace Bass’s 100-year-old camp on the rim. If time allows, head over to Ruby Point in the afternoon to soak in the view from one of the most scenic points on the rim. Today you start the descent down the South Bass Trail. This trail is steep in sections but relatively flat for about 1.5 miles (2.4 km) along the Esplanade, which is a high plateau in the canyon. The hike to the Colorado River is 8 miles (12.9 km) long with a drop in elevation of 4,440 ft (1,353 m). 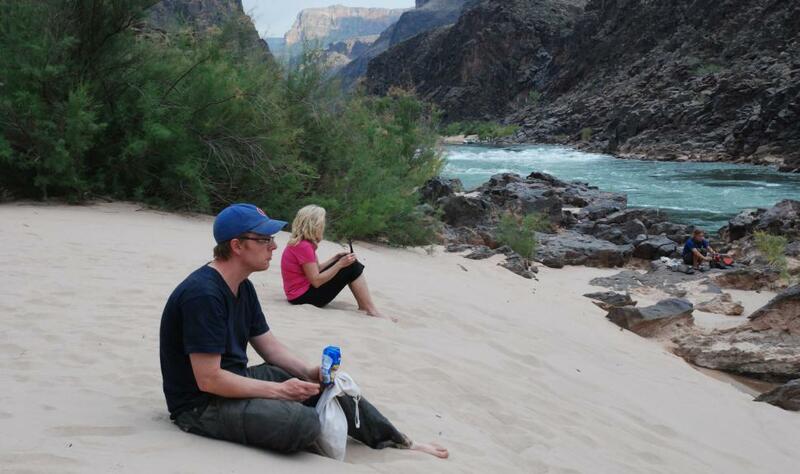 On this night the group will camp on the south side beach of the Colorado River along Bass Rapids. After breakfast, inflate the rafts you carried down to the river to paddle across the river to pick up the North Bass Trail. Once you reach the north side of the river, take a hike along the North Bass trail for 1.5 miles (2.4 km) until reaching Shinumo Creek. On this day, there is a short 2.8-mile (4.5 km) hike back to the rim with a 1,250-ft (380 m) elevation gain. It usually takes about two hours to hike out from here. About half way to the top, you will pass by ancient Native American ruins that are tucked away just yards off of the trail.